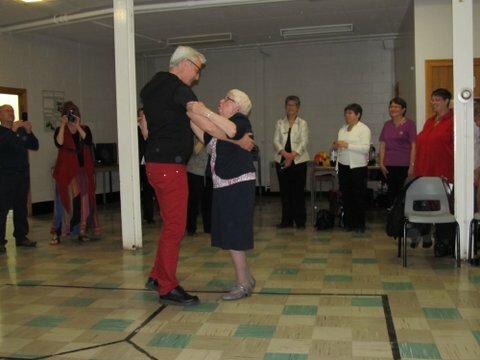 The last of the 2013 Companion of the Centre awards was presented last week to Jessie McLeod at the DUCC (Diakonia of the United Church) gathering at the Tatamagouche Centre in Nova Scotia. The Companion presentation was made on May 2, 2013. In attendance were CCS principal Maylanne Maybee and CCS program staff Ann Naylor and Ted Dodd, as well as many CCS friends and alumni who were attending the diaconal gathering. The evening was capped off with a ceilidh. 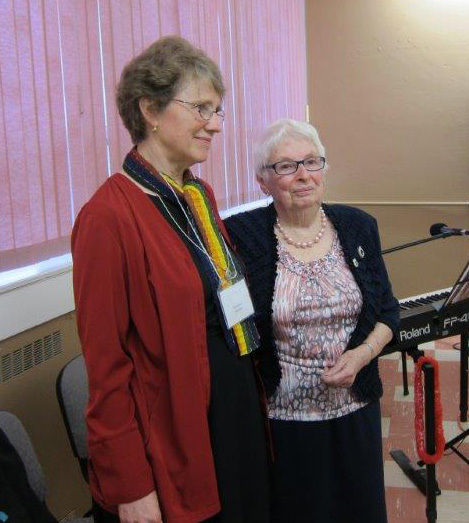 I am honoured to present Jessie MacLeod as one of the 2013 Companions of the Centre for Christian Studies. It is particularly meaningful to have this ceremony of recognition here, in this sacred place, a centre of learning, of activism, of worship, of community-building, of justice-making, of sanctuary, of hospitality, of peace…each of these being values and expressions of ministry held precious by Jessie. In preparing for this evening, I read the documentation that was compiled by the folks who nominated Jessie as Companion. What a privilege to witness the love and respect woven into this testimony! I think it is noteworthy that the nomination included reflections and letters from lay, diaconal and ordained members of the United Church, support coming from as close as some of the folks in this room and as far away as Alberta. Jessie MacLeod is beloved by God and by the people whose paths have crossed hers – for a brief moment of intersection or for a time of travelling together. 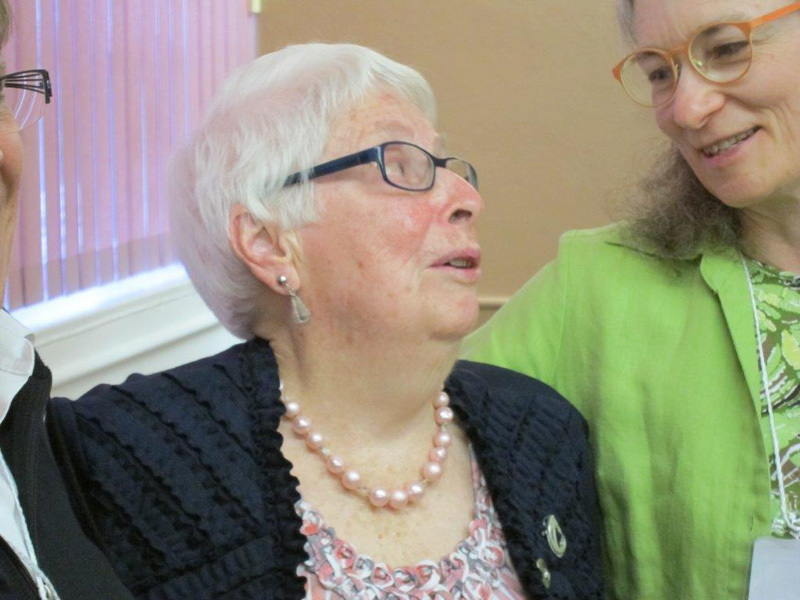 Growing up in a church family in Baddeck, NS, in the 1930’s, she was active in church leadership and was drawn to opportunities for further training. After completing business college in Halifax, she moved to Toronto to attend the United Church Training School and Victoria College, from which she graduated in 1950, having spent several months as a summer student in Success, Saskatchewan, using a bicycle as her means of transportation. Discernment of the Spirit’s call led Jessie to serve in ministry positions in Ottawa, Montreal, Vancouver, Sackville, Toronto, Halifax, and Sydney. Her work included, but was by no means limited to Christian Education, communicants’ classes, leadership development, Conference staff work in congregational life and work, teacher training, work in First Nations communities, Student Affairs on a university campus, Christian Development work in the General Council offices, pastor in residence at a theological school, training pastoral care workers, and preaching. 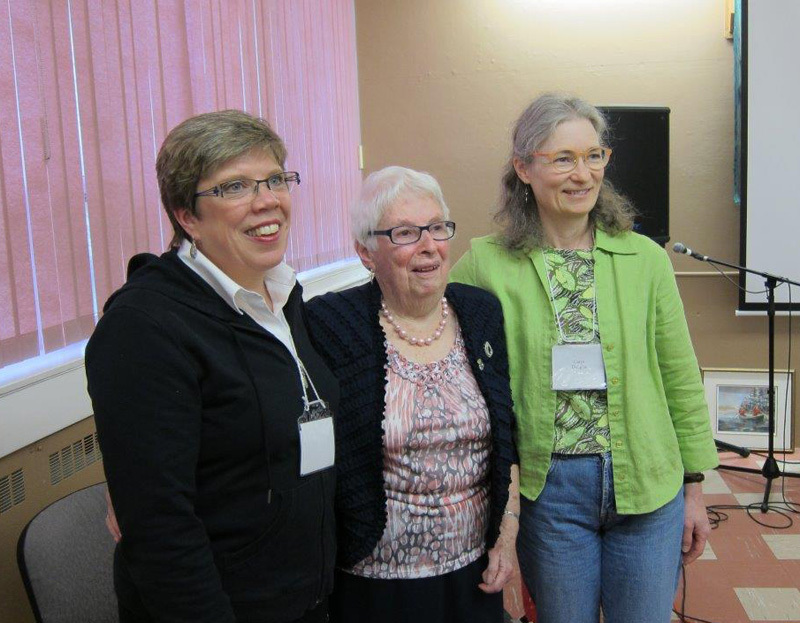 Also active as a volunteer, Jessie served on numerous task groups, commissions, and committees within the United Church and was involved ecumenically through the Student Christian Movement and Canadian Girls in Training. A voracious reader, Jessie has maintained a life long commitment to biblical study and to book studies. A CCS student, visiting Jessie in her retirement home, noticed that Jessie’s reading material looked very much like the assigned readings for the student’s CCS courses – so much alike that they were the same books. Jessie’s underlying focus in ministry, as recorded in her Curriculum Vitae in 1981, was the “desire to enable and equip lay people to express their Christian Faith, and to contribute their gifts as members and leaders in church and community”. Those of you who do not know Jessie may be creating an image in your minds that Jessie has spent her entire life going to church meetings. Not so. While church meetings have occupied a lot of her time, Jessie’s life outside church gatherings has always been active. You might spot Jessie gardening, hiking, swimming, golfing, cross –country skiing, reading, or at a concert or a movie. Jessie has spent her life supporting and encouraging women into church leadership, helping them to find their own voices. She is well known for her determination, her ability to sustain clarity, and her resolve to work though differences respectfully and tenaciously. The words “humour” and “subversion” were both used positively and with fondness to describe Jessie’s approach to resistance to change. Hospitality has been, and continues to be, a central value and a consistent practice for Jessie – welcome, inclusion, acceptance, respect… in her home, in her church community, in the wider community, Jessie is a constant, reassuring beacon of hospitality. Friend, mentor, supporter, advocate, teacher, prophet, and yes… companion… one who journeys with us, who ensures that we are not alone, who welcomes us and calls out the best from us. We , as the Centre for Christian Studies, are thrilled to name you, Jessie, as Companion. We, as a diaconal community gathered here, are delighted to support a choice well made, to celebrate this new and deeply loved Companion. We welcome you as a Companion of the Centre for Christian Studies. Thanks be to God. Thank you to Ann Naylor, Kathy Platt, Laura Hunter, and Maylanne Maybee for providing pictures. 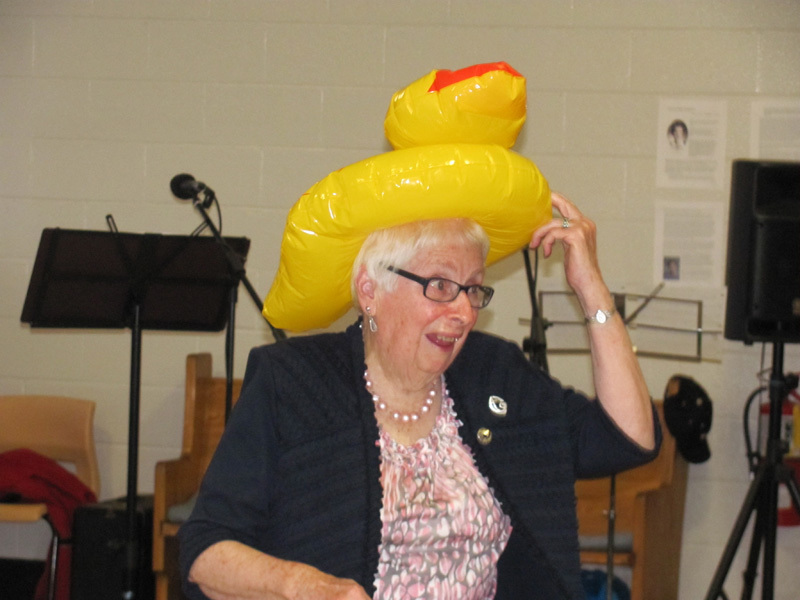 Jessie MacLeod, a proud DUCC… or is that duck?